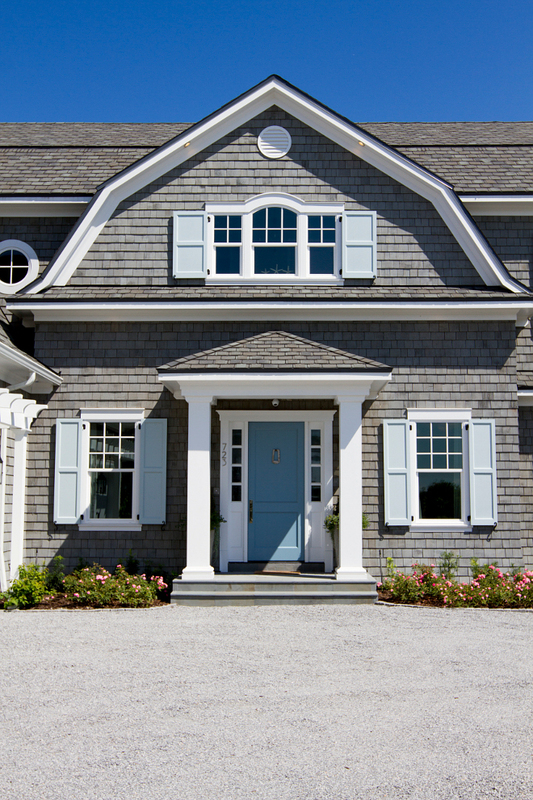 As an interior designer and blogger, there are many house types I like, but if you know me well, you know that nothing speaks louder to me than a shingle style Gambrel beach house. 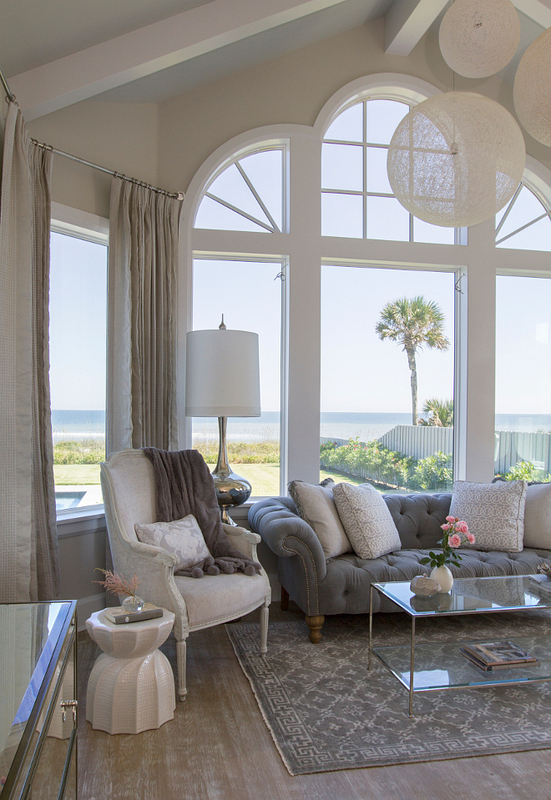 Located in Ponte Vedra Beach, FL., this shingle style Gambrel beach house was built for a beautiful family of six from Ireland. 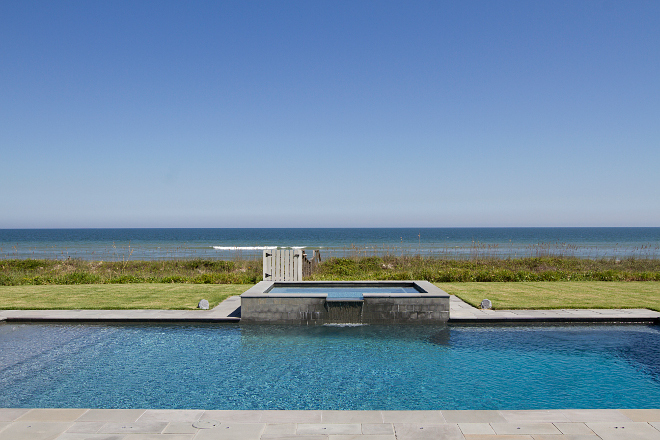 The family wanted to build a summer home and the builders, Heritage Homes of Jacksonville, and the interior designer, Villa Decor & Design, worked with the clients from day one on this project. 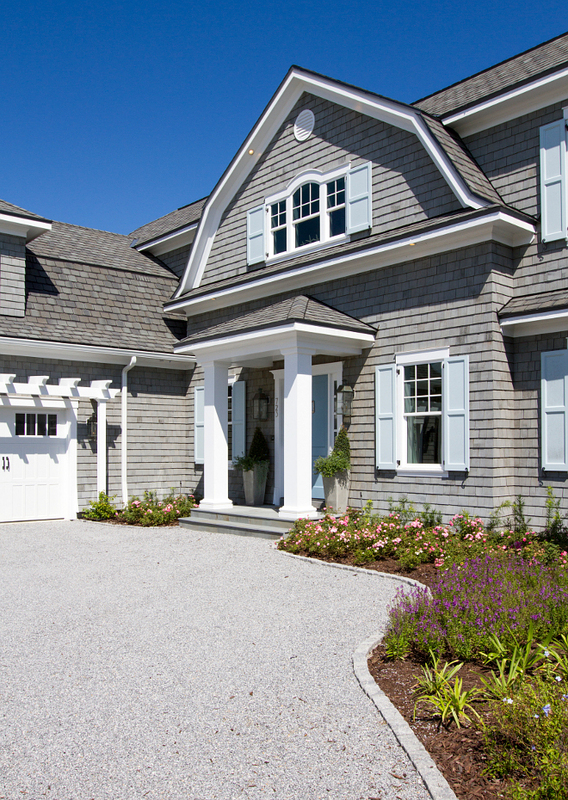 This shingle style Gambrel beach house features 5,042 heated SF, 6,407 under roof, 6 bedrooms, 5.5 baths and it certainly features one of the most beautiful combinations of soft gray paint colors I have seen in awhile, and as usual, I am sharing all of them with you! Let’s dream and make sure to save or pin these images. I highly recommend you to keep these beautiful paint colors in mind. 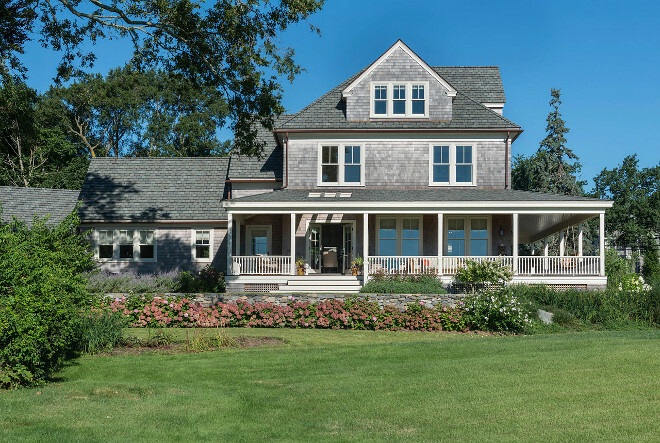 The homeowners of this shingle style Gambrel beach house were inspired for the home design by spending a summer in the Cape 27 years ago. 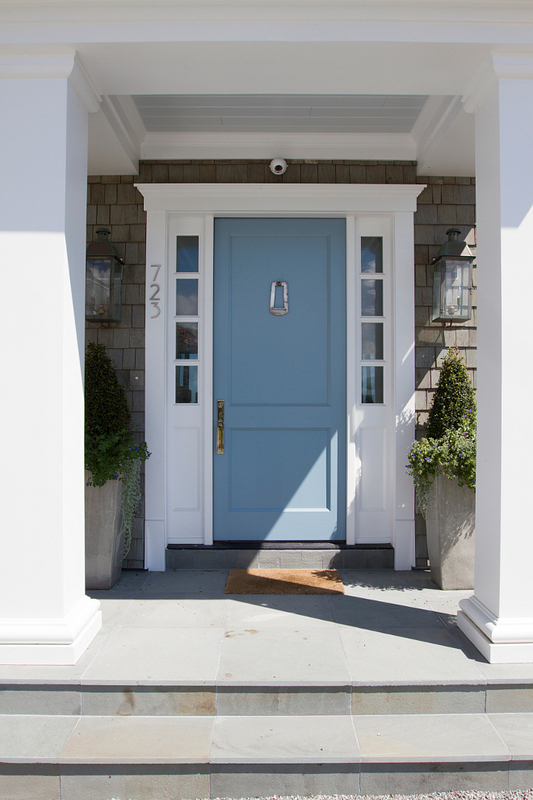 Exterior Trim Paint Color: “Benjamin Moore Decorator’s White”. The shutters paint color is “Sherwin Williams SW 6225 Sleepy Blue”. 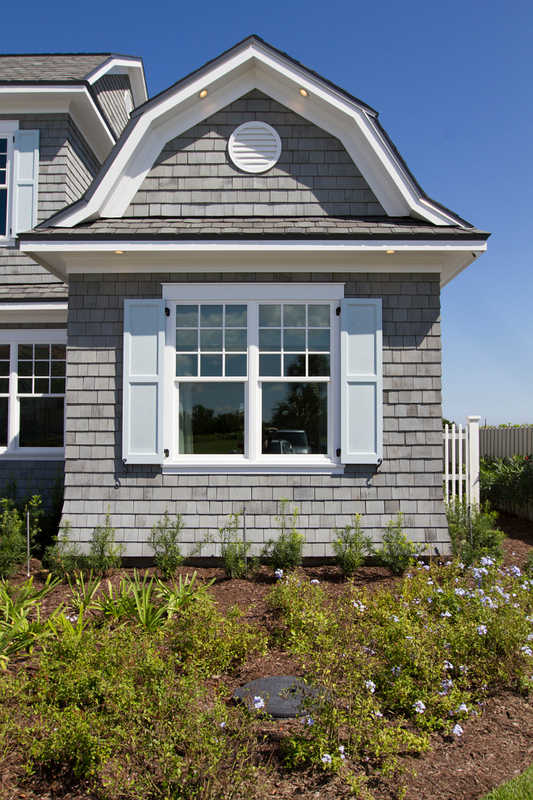 The siding of this Hamptons style shingle home is cedar shake painted. Shutters are Timberlane and windows are PGT. 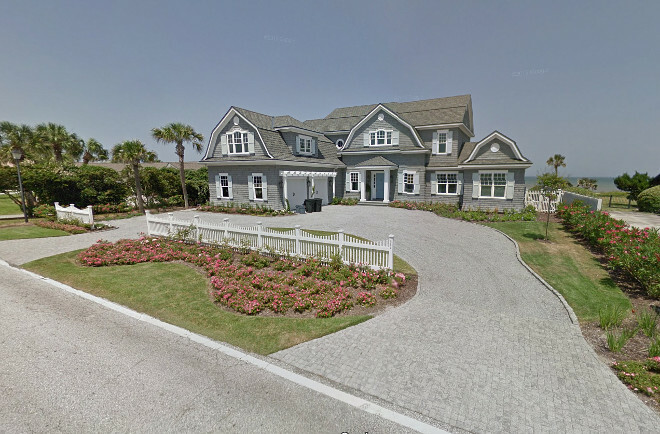 Nothing says more coastal than shingles and a blue front door. Paint color is “Benjamin Moore 1670 Labrador Blue”. Front door is made by Coppersmith. 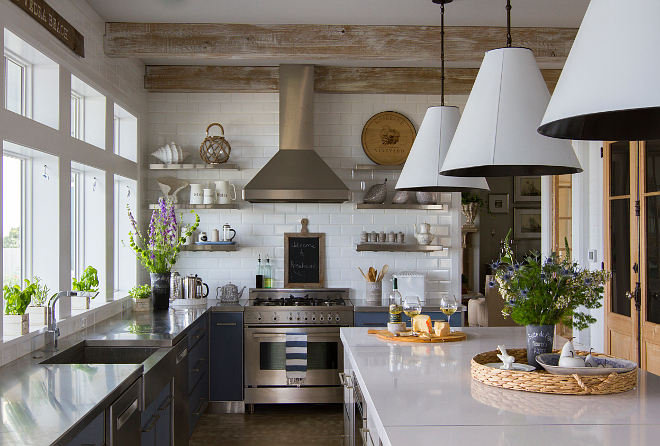 A perfectly low maintenance kitchen for watching the ocean tides and brewing a pot of tea. I love the rustic and modern feel of this space. The cabinets are by Jim Bishop Cabinet Co. The M06 frame on this door has the Aluminum finish and is shown with Charcoal back painted glass insert. M06 doors pair with back painted glass, in matte or gloss finishes, to create extraordinary looks. 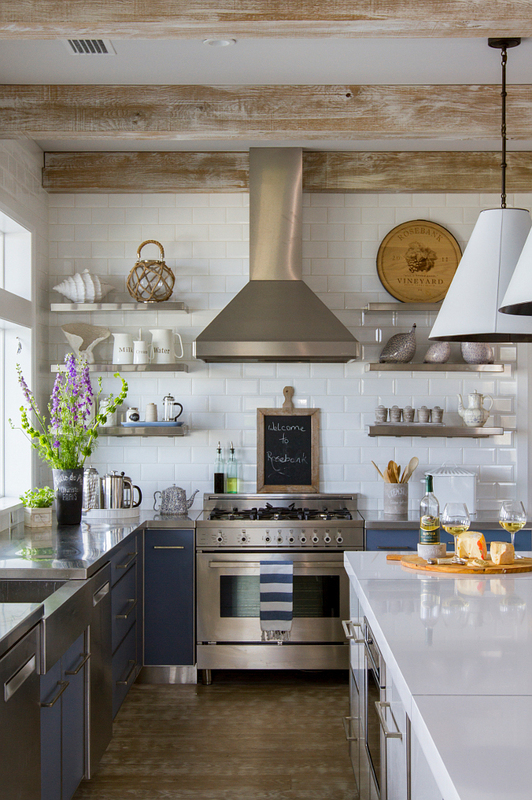 Backsplash is 4″x 8″ Beveled White Subway tile by Adex. 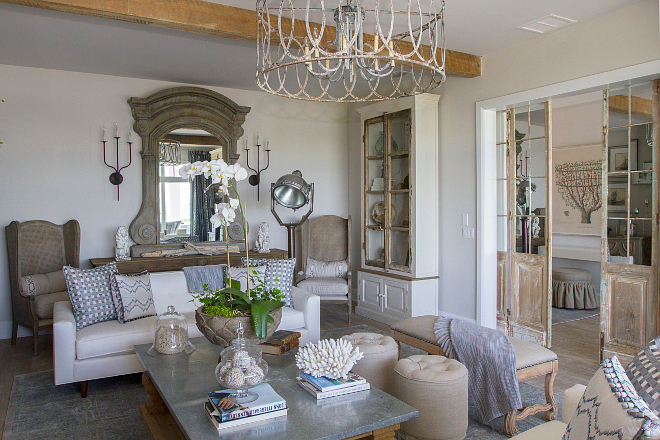 Ceiling feature wood beams with custom whitewashed finish. Ceiling Paint Color: “Benjamin Moore 1471 Shoreline”. This rustic beach house kitchen features stainless steel perimeter countertop and white quartz kitchen island countertop. 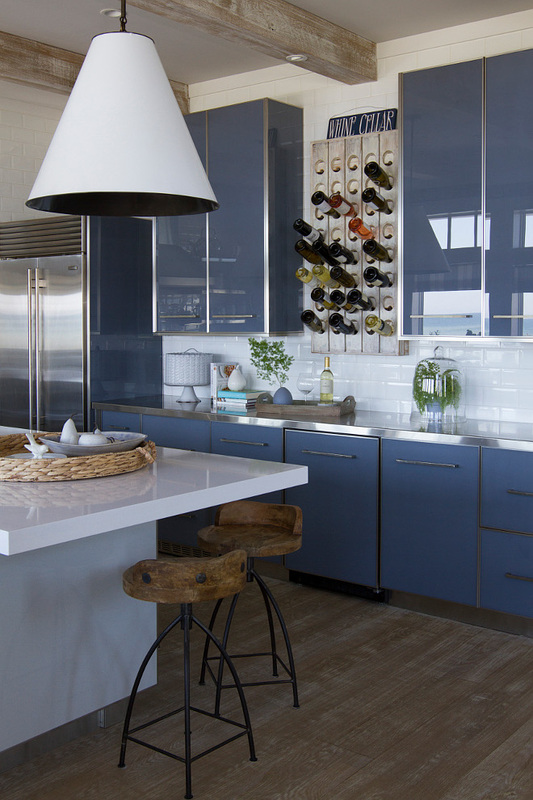 Floating shelves flank a stainless steel hood placed against white subway tile backsplash. Island countertop is White Zeus Quartz. 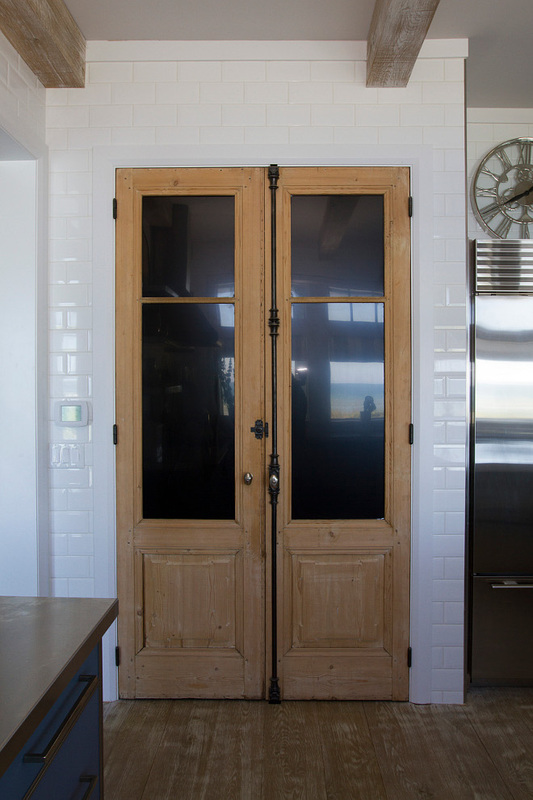 The pantry features a 19th Century pair of French Doors w/ Cremones. Cabinet hardware is Schaub & Company; Vinci Pull. 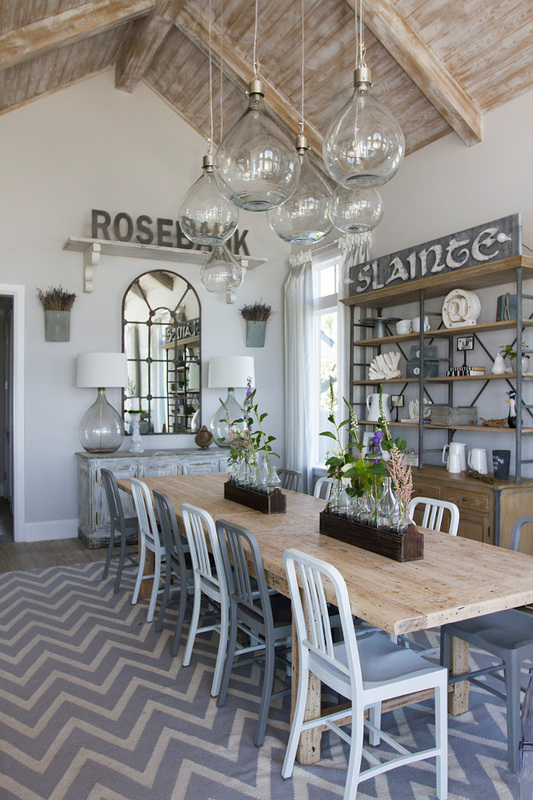 I truly love the farmhouse/coastal feel of this dining room. Isn’t it beautiful? I also love the pendant lights. The light fixture is Wine Sphere Chandelier Clear by BoBo Intriguing Objects – from $320.00 to $490.00 each. Paint color is “Benjamin Moore 1471 Shoreline”. 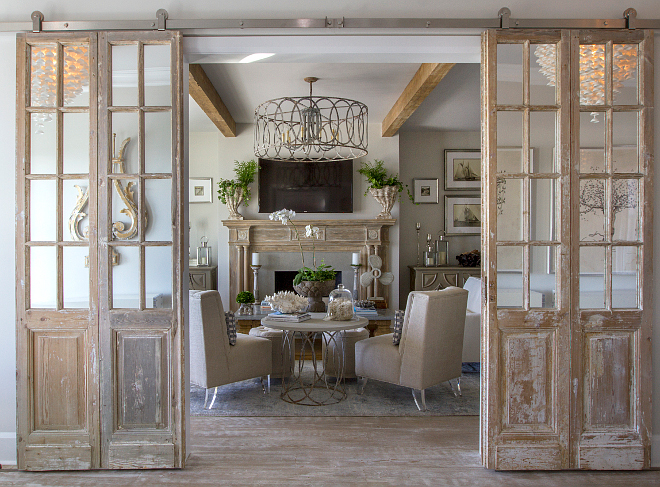 Mirrored antique doors were hung in a barn door hardware in the formal living room to bring character and patina. 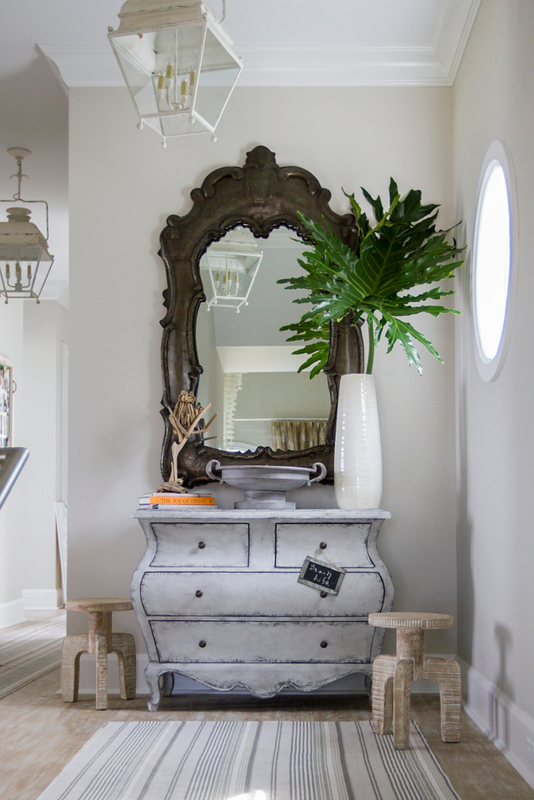 The pale pine vintage mirror door set also features a whitewashed finish. The living room mantel is a large American Mantel from Delancey House at Yale University. Paint color is “Benjamin Moore 1471 Shoreline”. 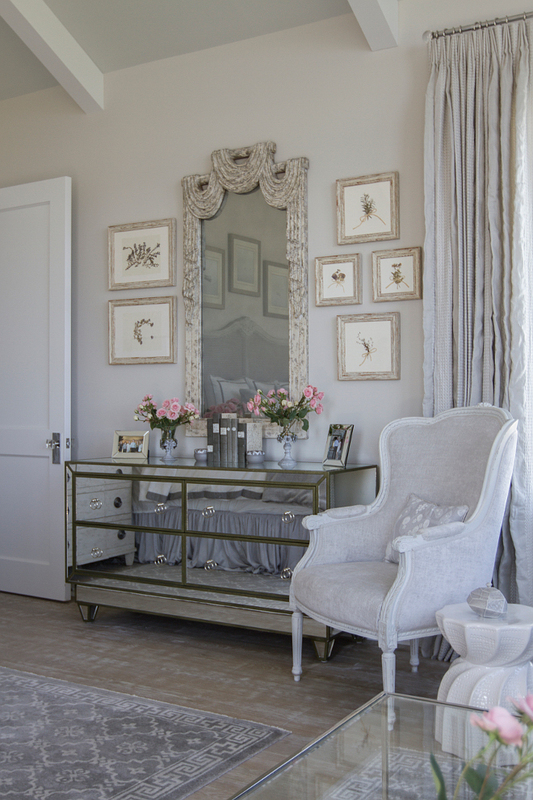 This is a great neutral pale gray that is perfect for French interiors. 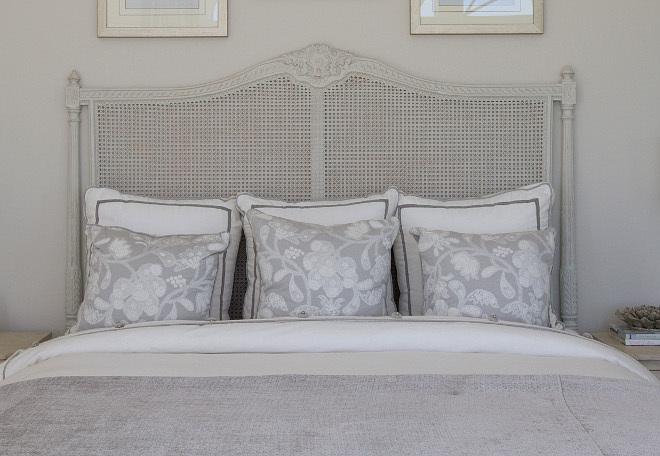 Pillows and furniture fabrics from Romo, Grey Watkins, Link, Colefax & Fowler. Wall paint color is Sherwin William SW7029 Agreeable Gray. Trim Paint Color: “Benjamin Moore Decorator’s White”. 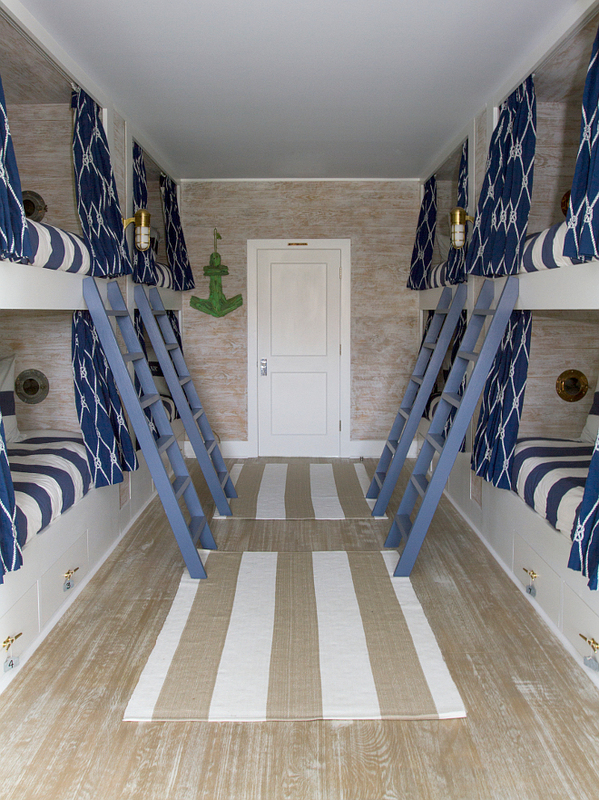 What a fun bunk room! I’m loving the bedding and the layout of this space. Floors and walls are unfinished White Oak with a custom whitewashed finish. Gorgeous ivory and navy bedroom with painted tongue and groove ceiling. Ceiling paint color is “Benjamin Moore Decorator’s White”. Wall paint color is “Benjamin Moore OC-23 Classic Gray. “. 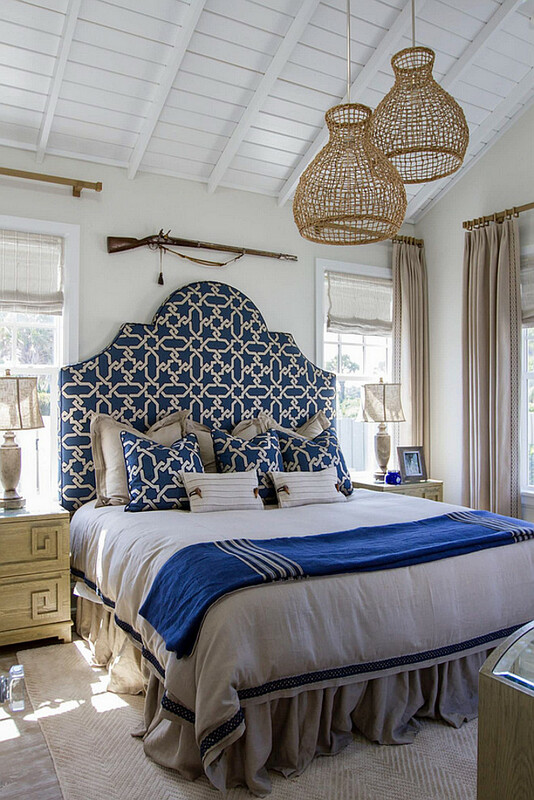 This is a well-appointed, relaxing room, with the exception of that antique rifle. Paint color is Benjamin Moore OC-53 Horizon. All custom window treatments and bedding by designer. 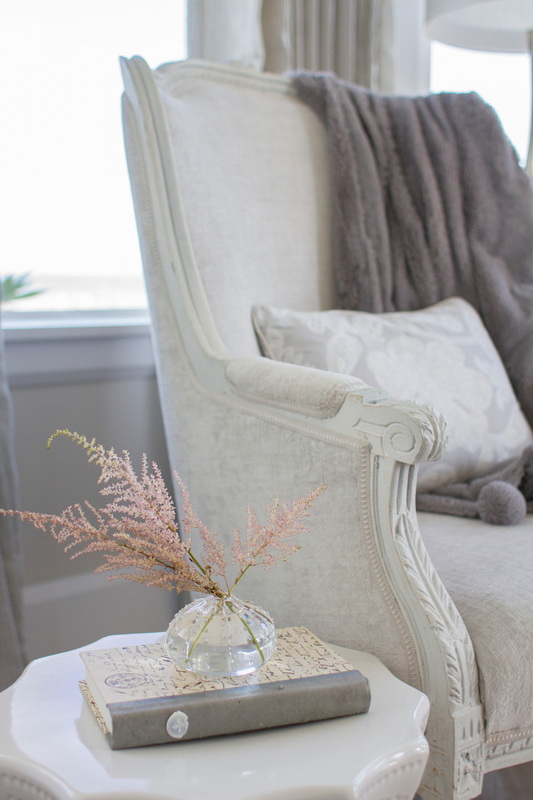 Fabrics are from Kravet, Highland court, Jane Churchill, Schumacher, and others. Trimmings are by Samuel & Sons, Travers, Kravet and Houles. These Woven Seagrass Pendant are affordable and stylish. 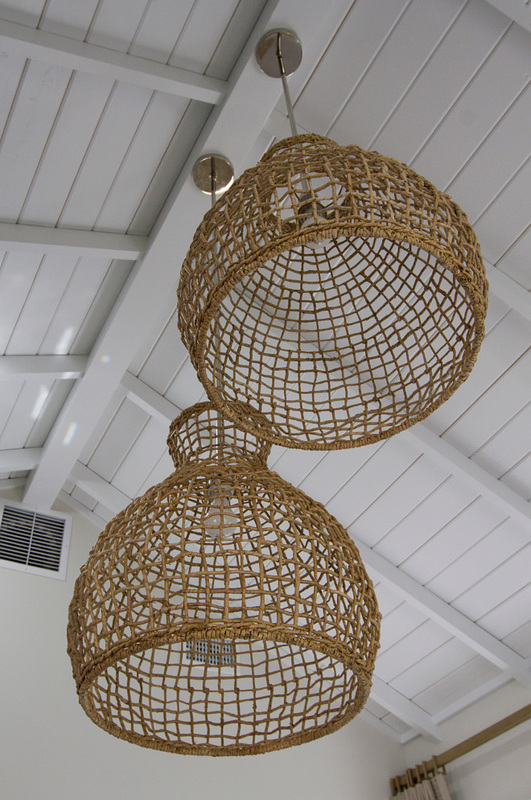 The Woven Seagrass Pendants are from West Elm – $89 each. 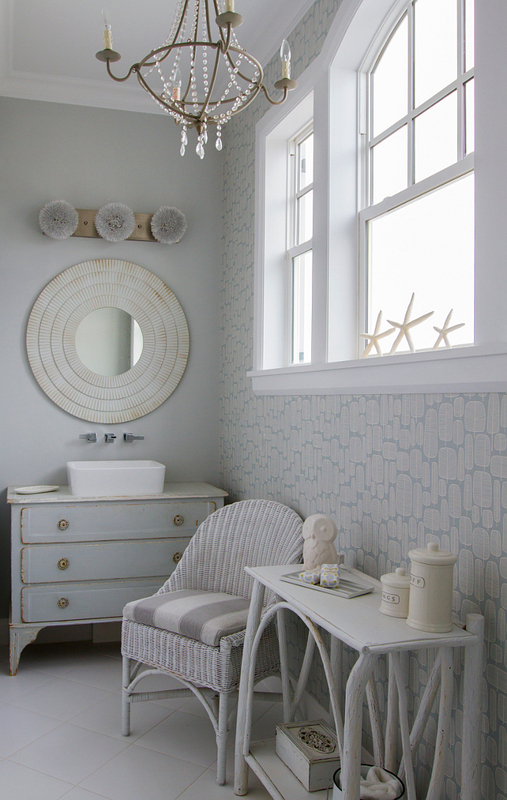 This is a fairy tale bathroom perfectly appointed with antique vintage finds. Accent wall paint color is “Benjamin Moore 1471 Shoreline”. 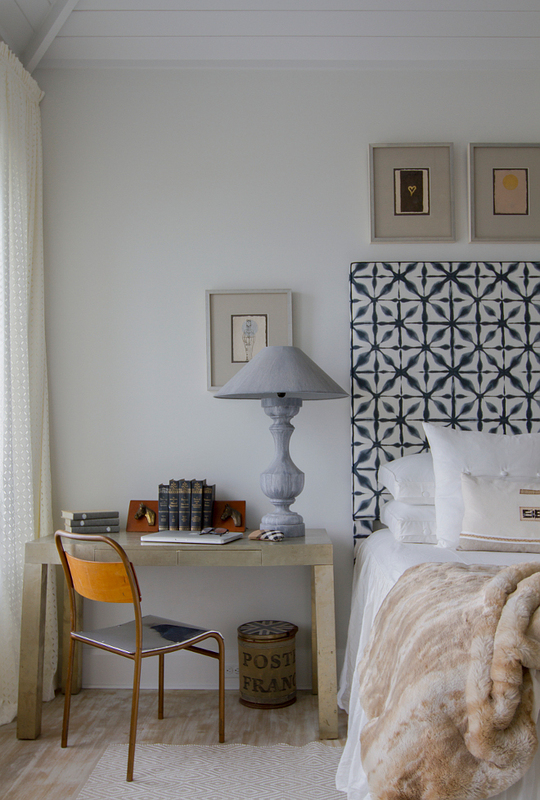 This bedroom mixes elements in a very elegant way. You will love it! The master bedroom seating area features floor-to-ceiling windows that beautifully frame the ocean view. 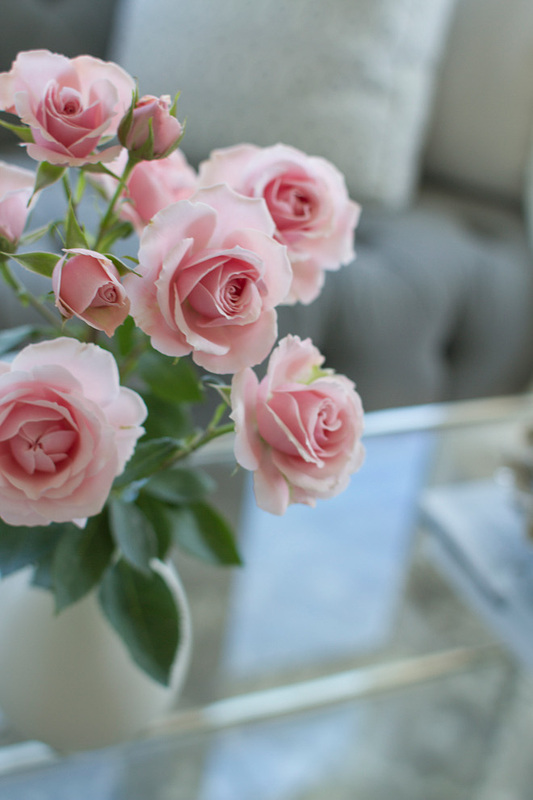 Fresh flowers are always the best way to add some color to any space. 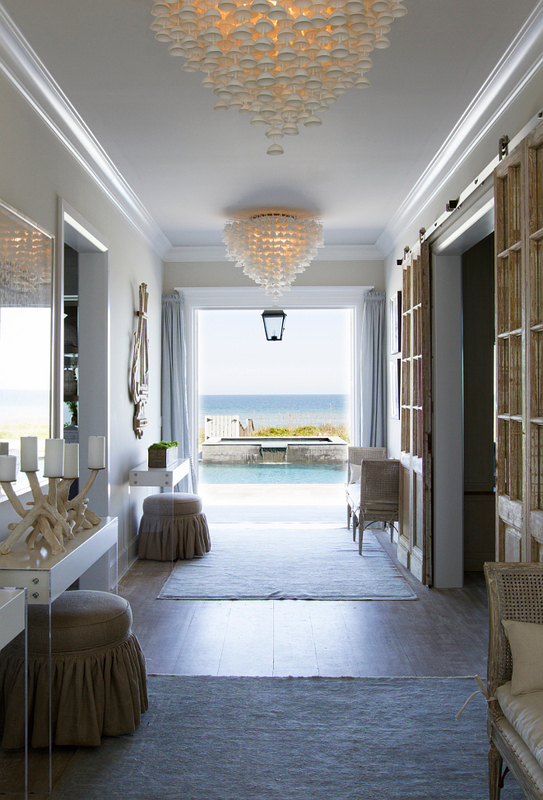 This beach house was decorated to perfection! 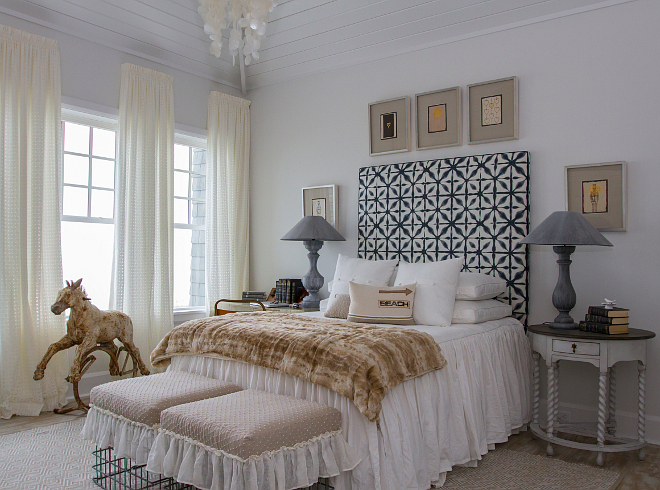 The master bedroom color palette is just perfect! Wall paint color is Benjamin Moore Light Pewter. Ceiling paint color is Benjamin Moore Decorator’s White. The bedding combines beautiful soft grays with crisp white fitted sheets. 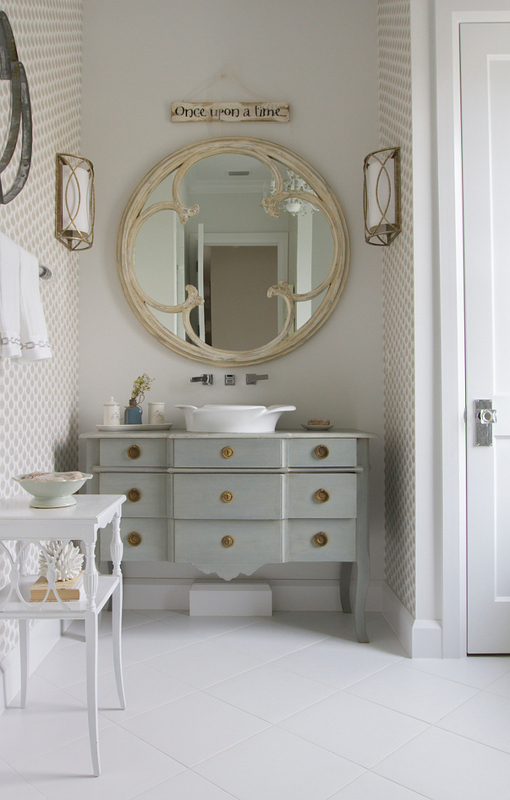 This bathroom features small hex Carrara marble floor tiles. The wall paint color is “Benjamin Moore Light Pewter”. 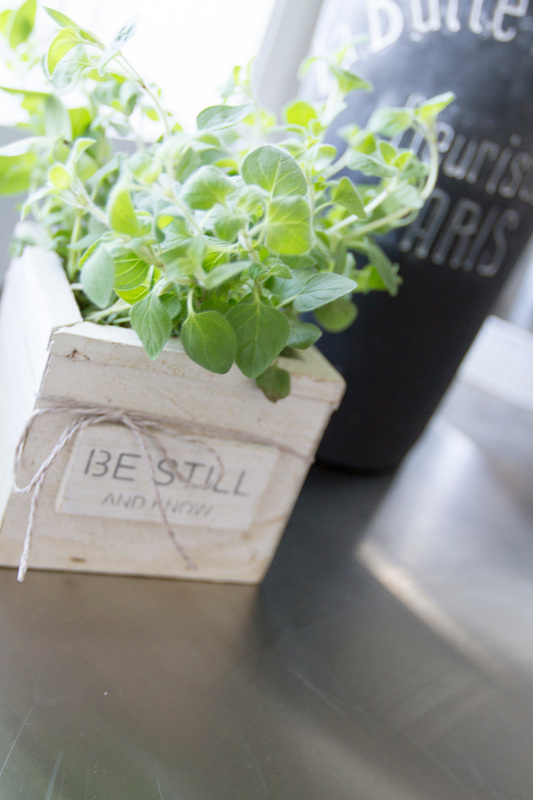 This calming paint color is “Benjamin Moore OC-53 Horizon at 50% strength”. Gorgeous French bathroom with antique dresser vanity and French chandelier. Some spaces really leave me speechless and this is one of them. Can you image living with a view like that? 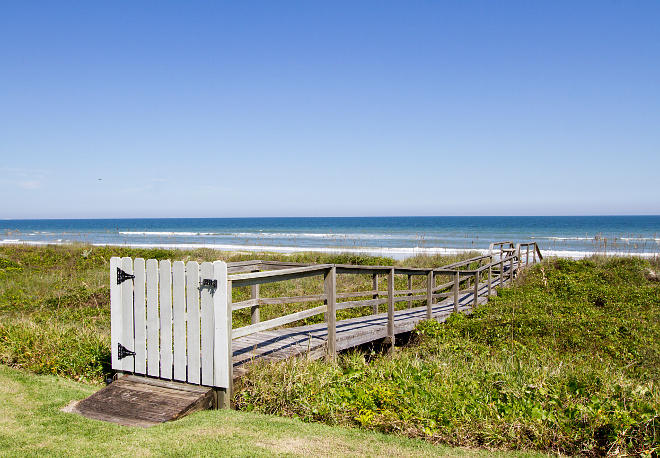 You open the doors and your stress would fly away with the ocean’s breeze. We can dream that, right? The hand poured porcelain cup chandeliers were imported from UK. 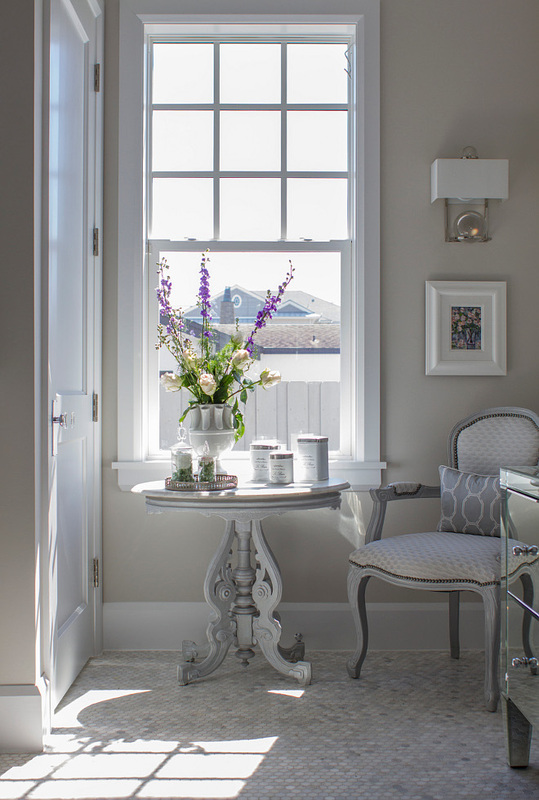 Paint Color: Sherwin Williams Reposed Gray at 50% strength. 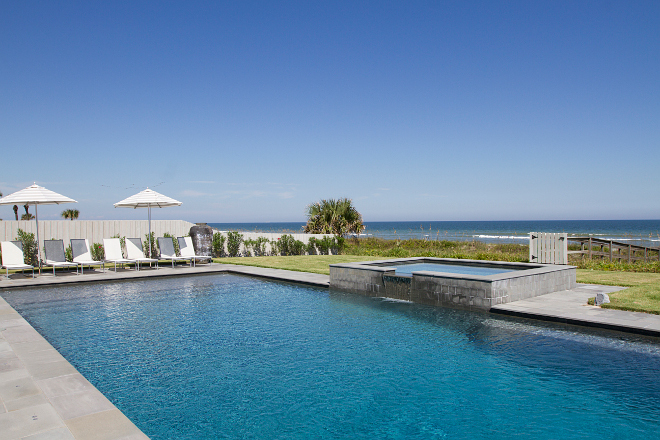 Swimming laps or relaxing pool side has never looked this good. A gate adds a sense of privacy to this dock and to the property. As summer approaches, make sure to relax and unwind and especially, make sure to spend some quality time with the people you love.